Irish onesie feature shamrocks and cute designs that will give your baby the luck of the Irish. An Irish onesie is a perfect gift for both a newborn and also for toddlers. An Irish onesie is also ideal for baby to wear on picture day and for St. Patrick's Day. Select from baby outfits that include shamrock onesies and sets with booties and hats. 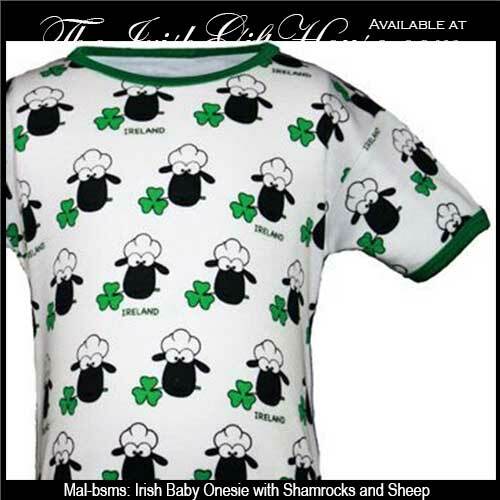 This Irish onesie features a super cute design for baby that features shamrocks and sheep along with the word Ireland scattered about. This Irish homecoming outfit for baby features shamrocks. This Irish baby outfit features a onesie along with a bib and booties; all are enhanced with shamrocks.